Clavell Caravans are a leading Nationwide Static Caravan Dealer. We provide to and buy from private individuals to all the large Caravan Park Companies in the UK. We can provide from a huge range of Static Caravans to either private customers, businesses, Caravan Parks or export customers. Whether you are looking for a Static Caravan to use for extra accommodation, to live in while self-building or renovating a house, for storage or to put on a Caravan Park that allows you to bring on we will be able to supply the perfect Static Caravan for you. Caravan prices range from £200 to £30,000. If we don't have the caravan you need, we can source it for you. We are extremely competitive dealers and offer a no pressure, hassle free service. We welcome all customers whether private or trade. If you have a Caravan Park and are actively looking to buy or sell stock, individual units or in quantity, please get in touch. Please feel free to browse our website and learn a little more about the excellent services that Clavell Caravans provide including - export, Caravan Transport, Emergency Accommodation, Site Surveys and Caravan Installation and much more. Visit our Caravan Stock page to view Static Caravans currently available. Clavell Caravans are a well known reputable supplier of quality used Static Caravans to many Export Companies / Customers. We have been arranging the Export of Caravans for over ten years. We understand the Export process and can arrange to have your Caravan shipped from any UK Port. And sell all over europe. Clavell Caravans are well established and competitive buyers of both Static Caravans and Touring Caravans. We buy Nationwide from the Highlands to Cornwall. We cover the whole of the country and can usually have a purchase completed within a few days. Need accommodation and quick...Thought about a Static Caravan? 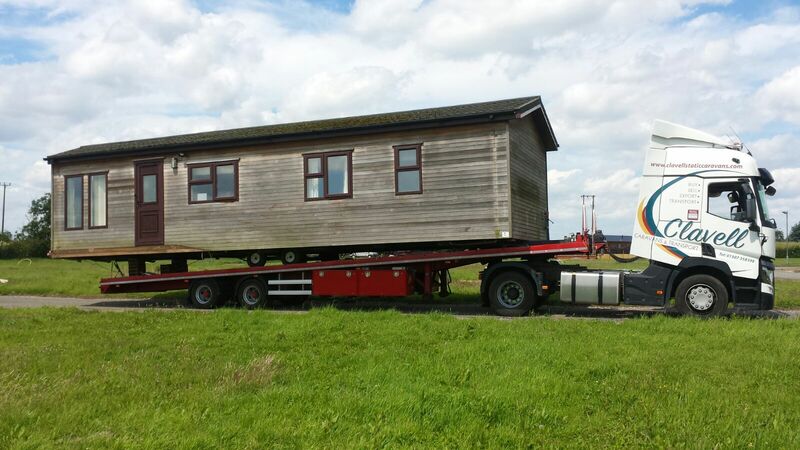 Caravans at sizes up to 42x14 feet for single unit can be ready for Transport immediately. This may be the quick solution for you.